It was with a real sense of excitement that I set off this morning. 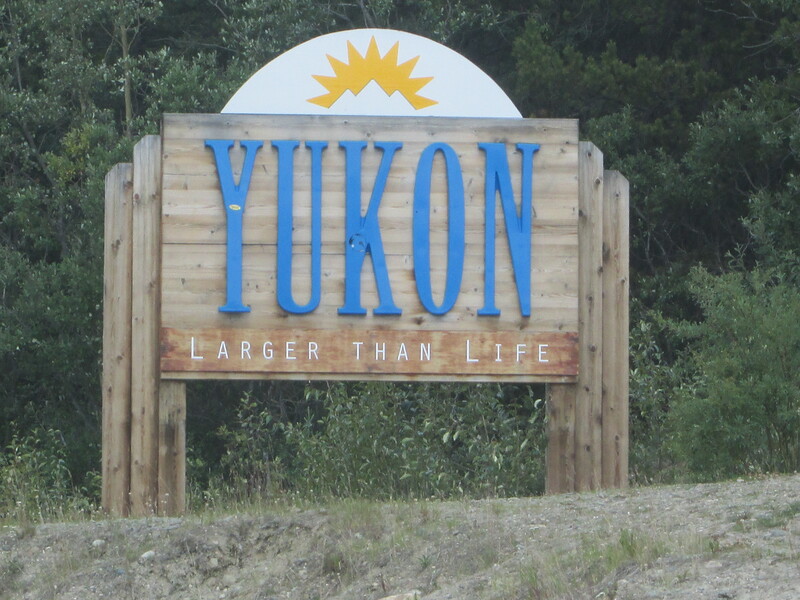 It is 724 km to the Yukon border, with not much in between. Since it is so hot I made the effort to leave early. I saw two black bears today the first was after 40 km and I just happened to look up and at the top of the bank was a small black bear looking back at me. I took a photo and then a car came and he turned and bounded away. 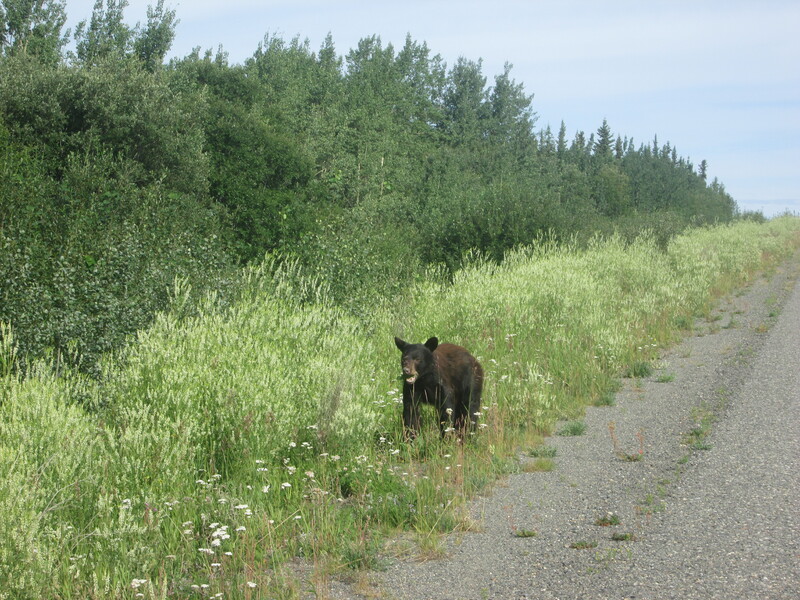 Then late in the afternoon I came across a black bear walking along the road In front of me. I hung back. A car would come and it would hide in the bushes. As soon as the car had passed it would come back out. I crossed to the other side of the road to see if I could get a better chance to pass it. It eventually decided to cross the road right in front of me. This Black Bear wasn’t so small. It stopped on the road turned and had a good look at me before heading into the bush and I was able to get past safely. I ended up going 200 meters down the road and putting my tent up on the side of the road. The insects were crazy. I got in my tent as soon as possible. Just opening the door of the tent to get in, let in a hundred bugs. I slept well last night……….even knowing there were bears around. I did have the bear spray next to my pillow. This morning I only went a few kilometres down the road and I had a mother Black Bear and her cub cross the road in front of me. Today I am taking a two-day 120 km detour to cycle the 37A better known as the Ice Highway to Stewart. Everyone I have spoken to has said how beautiful it is. They weren’t wrong. 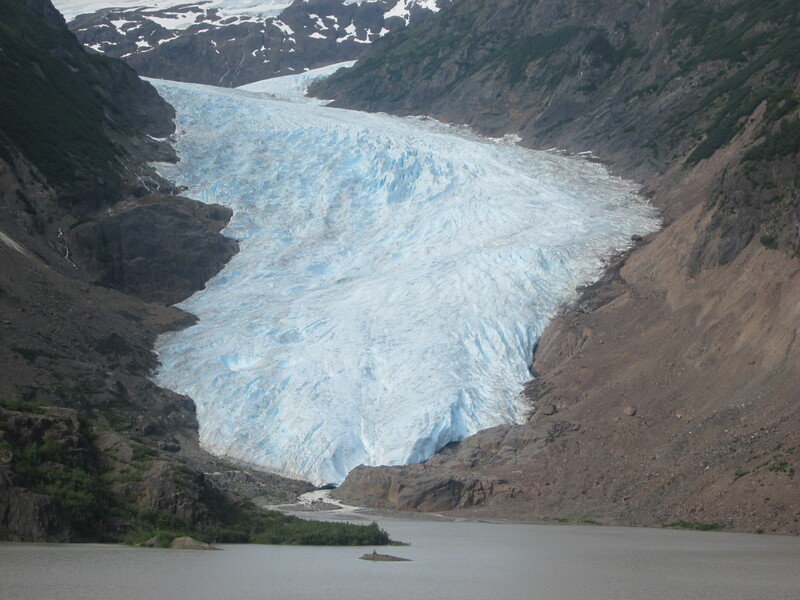 There were many glaciers, some reaching down to the road. The mountains were steep and at some points the valley came together; just enough room for the road and the river. You could hear the water gushing down the mountains from the many waterfalls. Stewart is an interesting town. 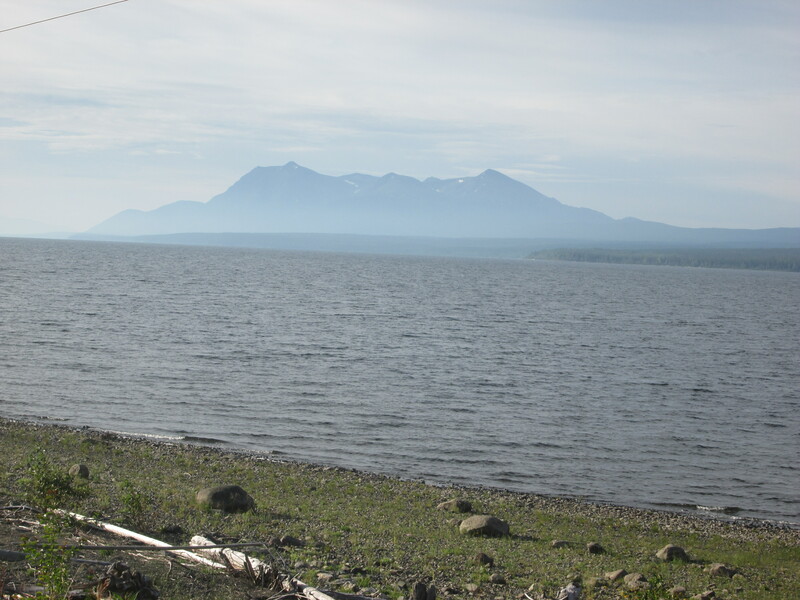 It is at the end of the world’s 4th longest fjiord. In its heyday it had 10 000 people looking for gold. It started raining at 1 a.m. and when I woke up at 5 a.m . it was light. But the mountains and the fjiord were completely covered by low cloud and mist. I waited an hour and packed up as normal. I was then humming and harring on whether to stay another day in Stewart, or cycle on. At 8 a.m. I bit the bullet and went for it. The light rain was okay for now. Getting back to the main highway was 60 km all uphill. Beside the river, low mist was hovering on the road and the waterfalls were gushing with water, as was the river. I made pretty good time to get back to Meziadin junction for midday. 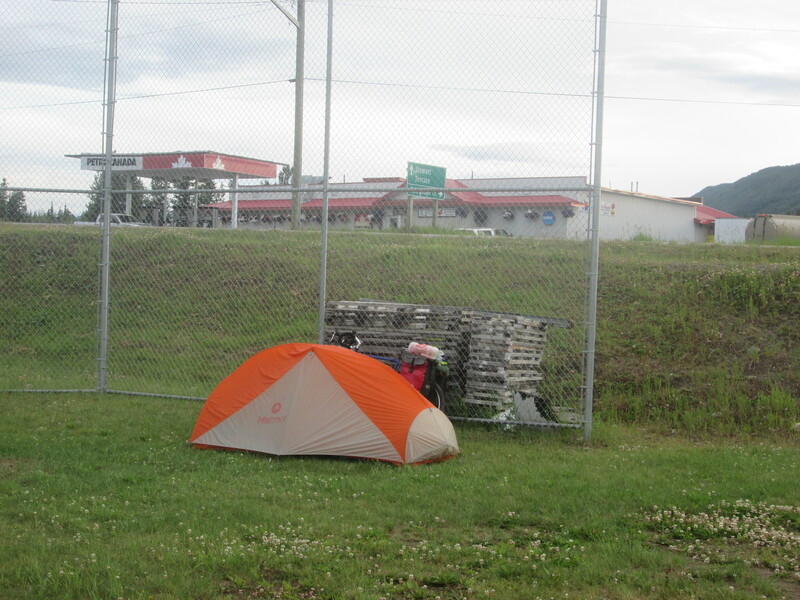 There is a gas station and a man camp with accommodation and a restaurant for the work gangs in forestry and road. I had an awesome bowl of mushroom soup to warm me up. After lunch the main highway climbed sharply and the rain got heavier and heavier. It wasn’t very pleasant. I got completely drenched and after a downward stretch I was freezing cold. As soon as I got to a rest area, I decided I was going to stop for the day. I got my tent up first between showers and then changed in to some dry clothes. I chucked my bike in the men’s toilet to get it out of the rain and I then went 50 metres away and cooked up a big pot of pasta under the shelter outside the ladies toilet. It is good practice to store your food and to cook well away from where you are going to sleep so as not to attract the bears. 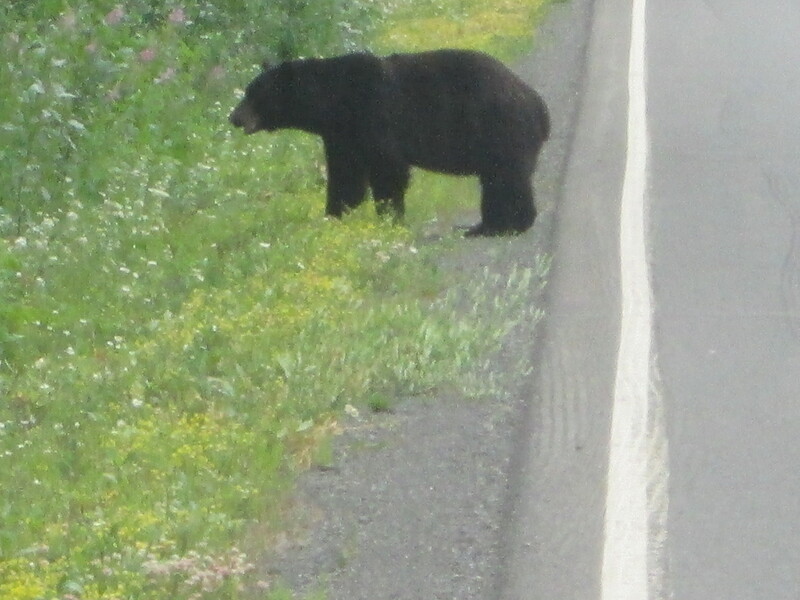 Speaking of bears, I saw another one this afternoon that was eating berries in the bushes beside the road and as soon as he saw me he turned and ran. I only saw him when he started running. Yesterday evening it cleared up and even the sun came out. I thought I was going to be in for a good day. During the night the rain returned so it wasn’t much fun this morning when I put my wet clothes from yesterday back on and then set off in the drizzly rain. No point putting on a dry set of clothes as it would just be a waste. I wasn’t feeling too happy cycling in the rain and 2 km down the road I discovered I had a flat. Didn’t fancy changing it in the rain so I just pumped the tyre up a few times to get me the 60 km to Bell 2 where I could change it under a shelter out of the rain and call into the cafe for a another hot bowl of soup. Saw two more bears this morning. One was on the side of the road, but ran away when a big truck came. The other was in a bush eating berries beside the road and ducked its head down as I cycled past. Just before the end of the day I ran in to 3 cyclists: English, Swiss and Australian heading South. We decided to stop and camp together beside a bridge. 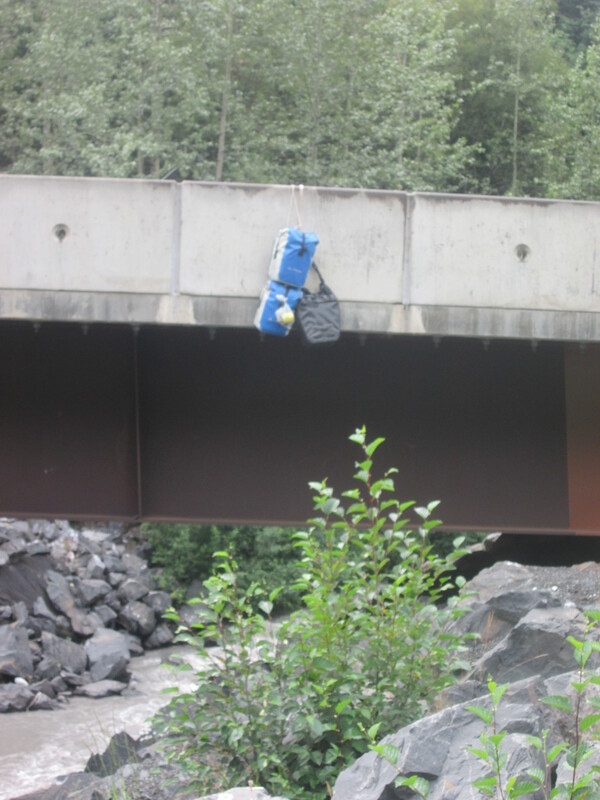 After dinner I hung my food panniers off the side of the bridge out of reach of any bears that might be around. Like yesterday late afternoon the weather cleared up and the sun came out. I only cycled a couple of hundred metres this morning and I could hear some howling of either wolves or coyotes from across the valley. Just before Tatogga I stopped at Tatogga lodge. It was like a museum with all the old stuff they had inside and the many stuffed animals. I treated myself to a big burger and fries. The ladies in the kitchen had just baked some cookies and a few of the Macadamia kindly went my way. A lady came into the restaurant with her boss and asked if I was cycling. Stacy and her boss are prospectors. Stacy very kindly gave me a big bag of food to take with me – apples., apricots, raisins, garlic, onions, lentils, couscous, some drink cartons and some gummy bears. It was a tough day of uphill cycling. 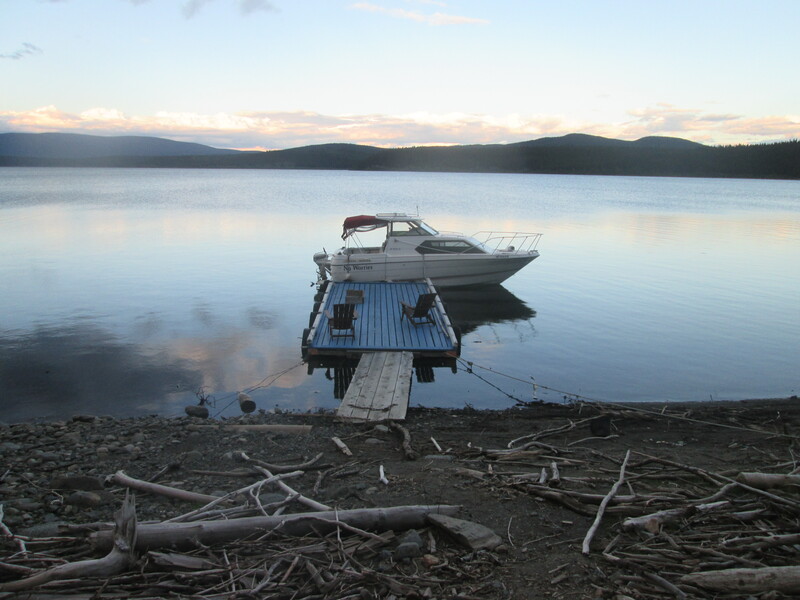 Thankfully it only started to rain 2 km out from Dease Lake. It was a very scenic drive. Unfortunately I haven’t taken any photos for 3 days. Two days because it was raining, so the camera didn’t come out and today because both my camera batteries are flat. Usually I am able to keep them charged up. Not this time. 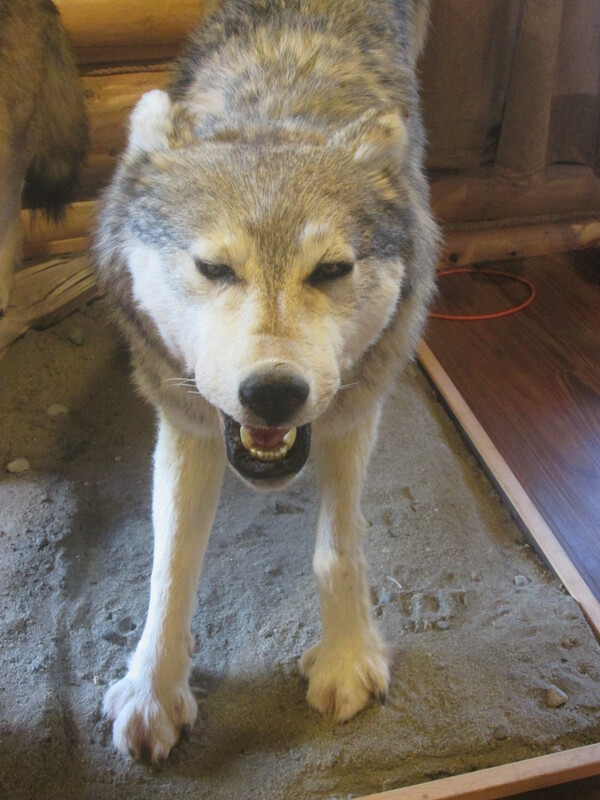 As I get closer to the Alaskan border I am starting to get worried about my visa. I have a horrible feeling I am going to get refused because when I first arrived I was only stamped in for 3 months when it should have been 6 months with the B1/B2 class visa that I hold. I am hoping they will look favourable upon my situation. But I am also getting prepared for the worst and contemplating some contingency plans. It was raining again this morning and to make things worse my back tyre had gone flat overnight. So I had to fix that. The last few days I have been finding it hard to motivate myself. 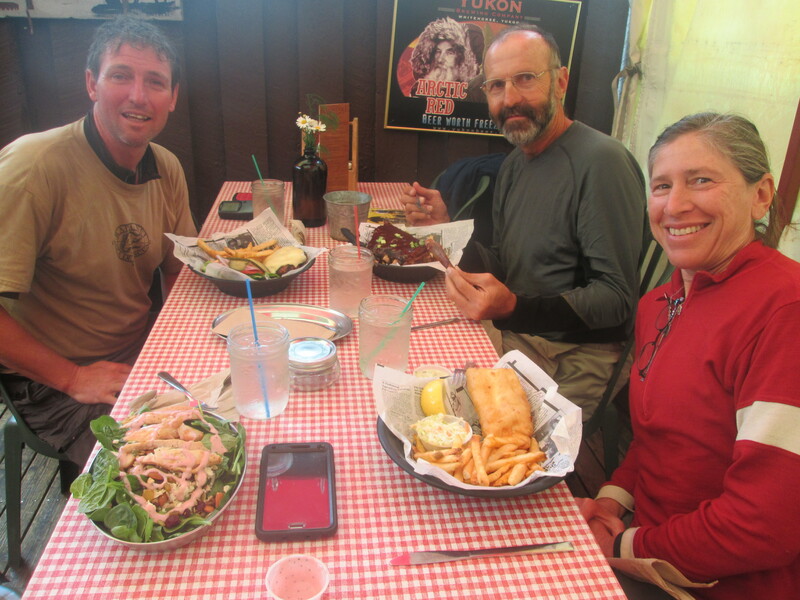 I met a group from Adventure Cycling that are also heading to Alaska. I cycled on and off with a few of them today. They stopped to camp after 90 km at a nice rest area by the river. 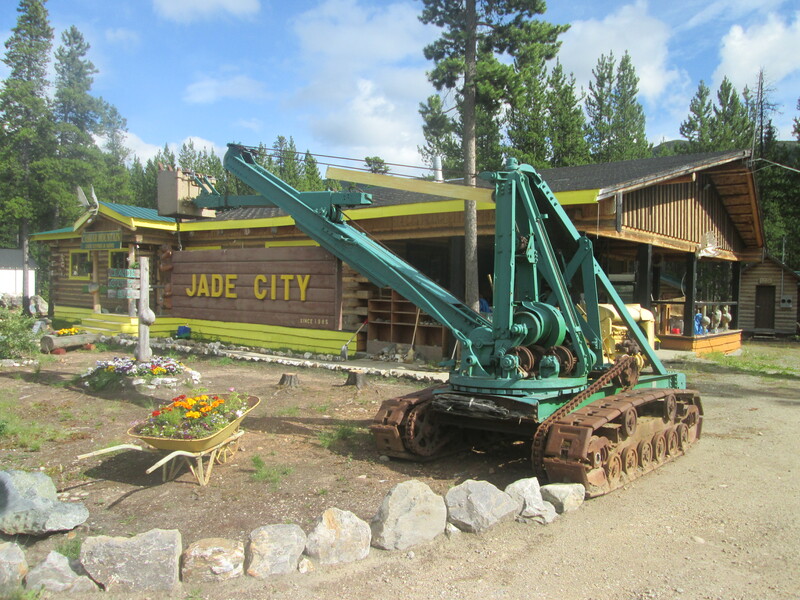 I pushed on for another 26 km to Jade city. Here they mine 90 percent of the world’s Jade. 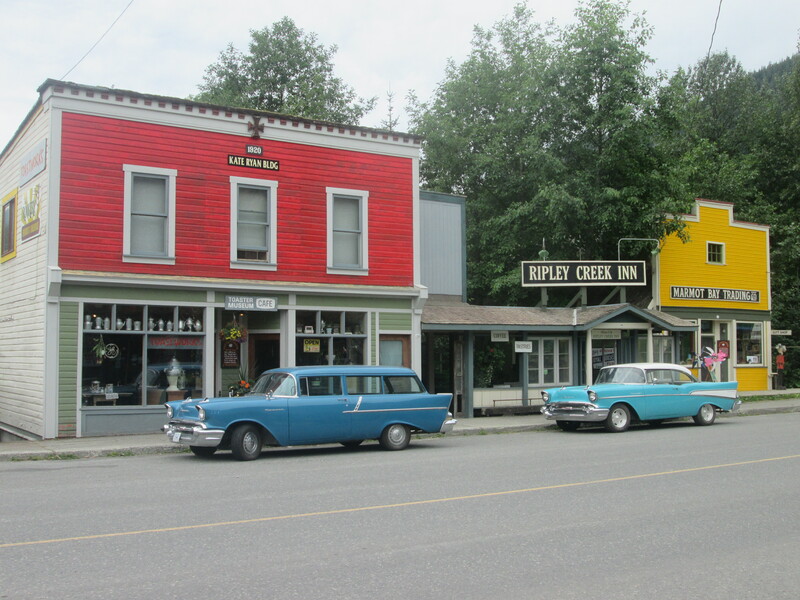 The city is a collection of gift shops, a restaurant and a whole collection of old mining equipment. You are allowed to free camp here which is nice. I treated myself to a eat as much as you can $20 Smorgasbord in the restaurant. 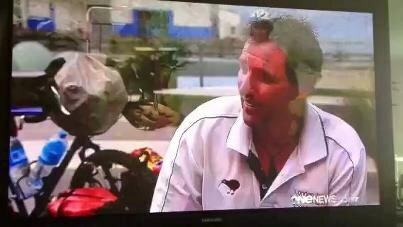 I have come across another reality TV show. Jade Fever is filmed here and shown on the Discovery show. Sure enough – I googled it and pictures of the family came up as I watched them sitting in the restaurant. 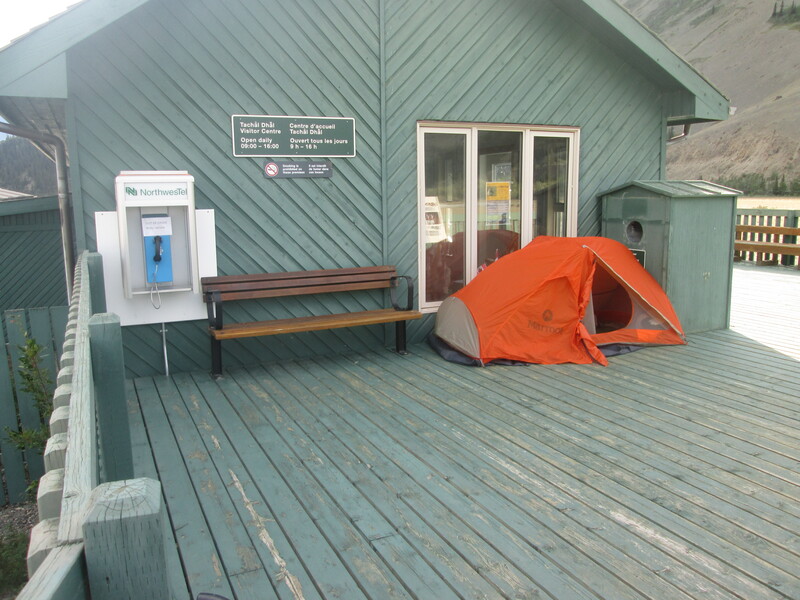 I am now only 120 km from the Yukon border and I plan to cross over tomorrow. After such a good dinner last night I got sucked into going back for the breakfast. Luckily the first 30 km was mostly downhill. 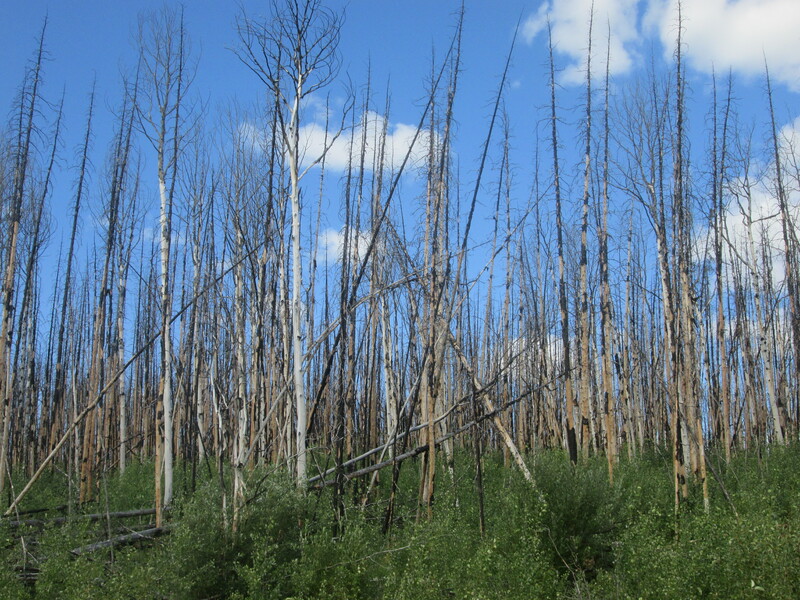 The last 60km there was evidence of a large forest fire from a few years ago. All the trees on both sides of the road were burnt. 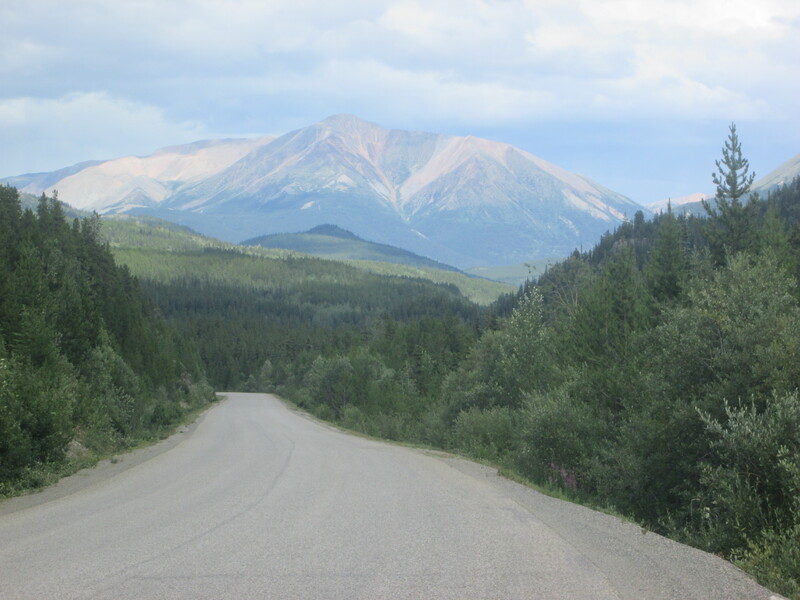 Late in the day I crossed over the border from British Columbia into the Yukon. Just after the border I got another flat tyre. Two in two days. I ended up pushing my bike the 500 metres up to the gas station. I am surprised with how many punctures I am getting. It is a bit of a worry. The lady at the gas station kindly said I could camp for free in the RV park. 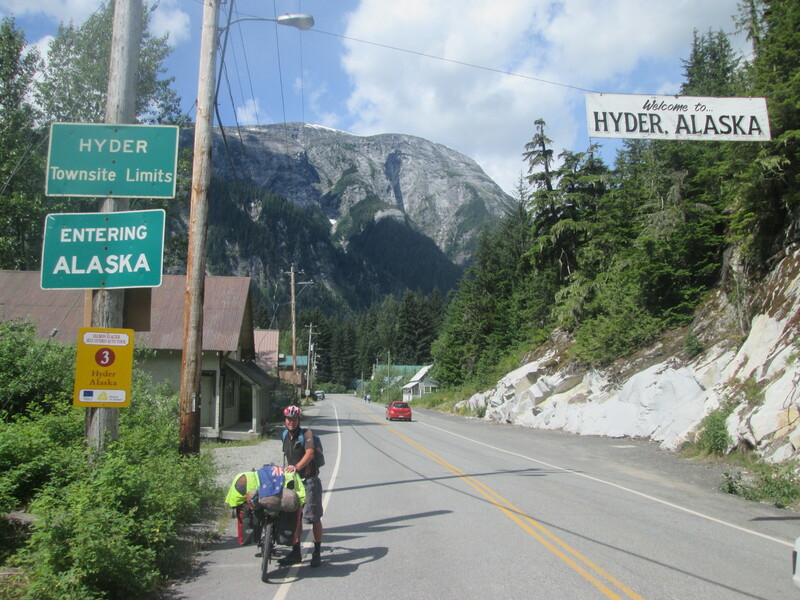 This morning I started cycling the Alaskan Highway. I only cycled a few km when I could hear a crashing through the bush below the road. I looked down and could see the back end of what I thought was a horse. Then I saw its antlers and realised it was a huge moose. It was such an awesome sight and the first time I have ever seen a real moose. Often with a border crossing there is a change in scenery. The landscape is a lot more open here and the trees are really small. In the afternoon I got slammed by a headwind. It was brutal. I was down to a crawl. 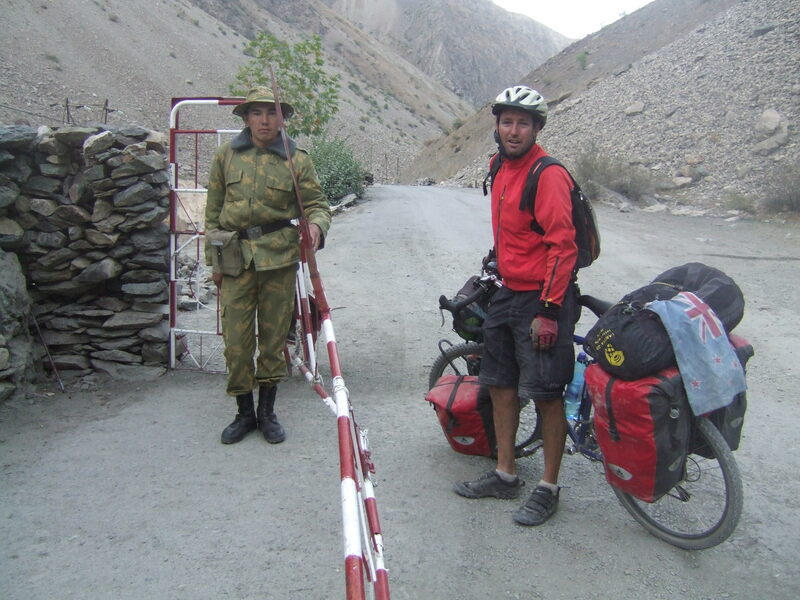 I persevered for a few hours before stopping at Rancharia where they are letting me stay for free. It used to be one of the original stops when the highway was first built. 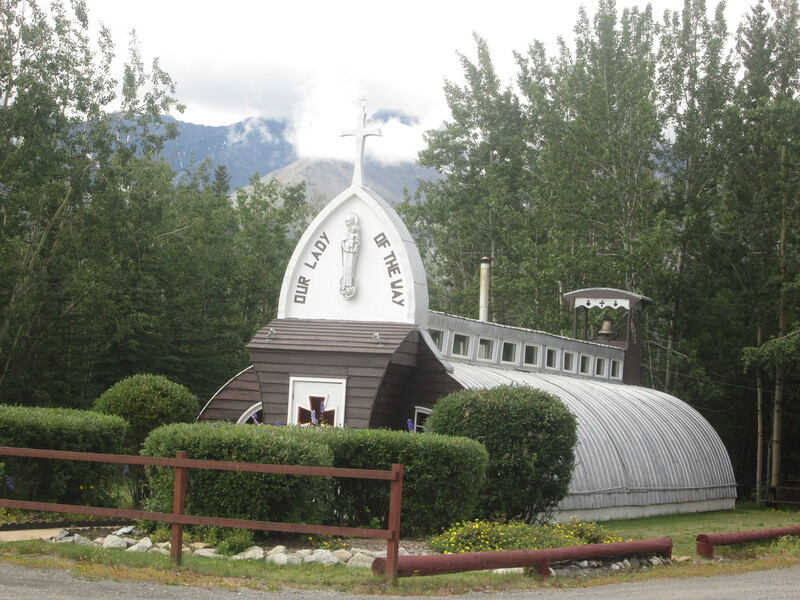 Rancheria and Teslin, only the remains of the old service stops now long closed and in disrepair. 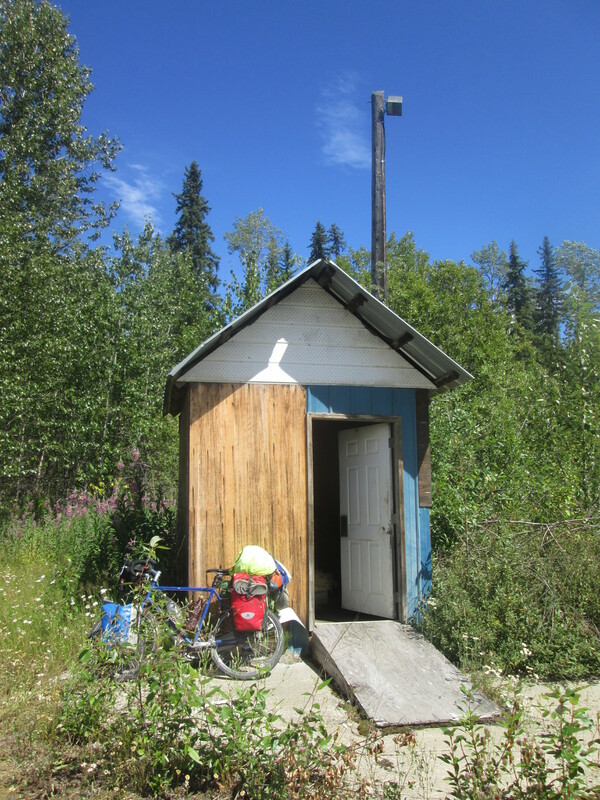 I got a “Warm Showers” host in Teslin. That’s partly why I was so keen to make it there this evening. 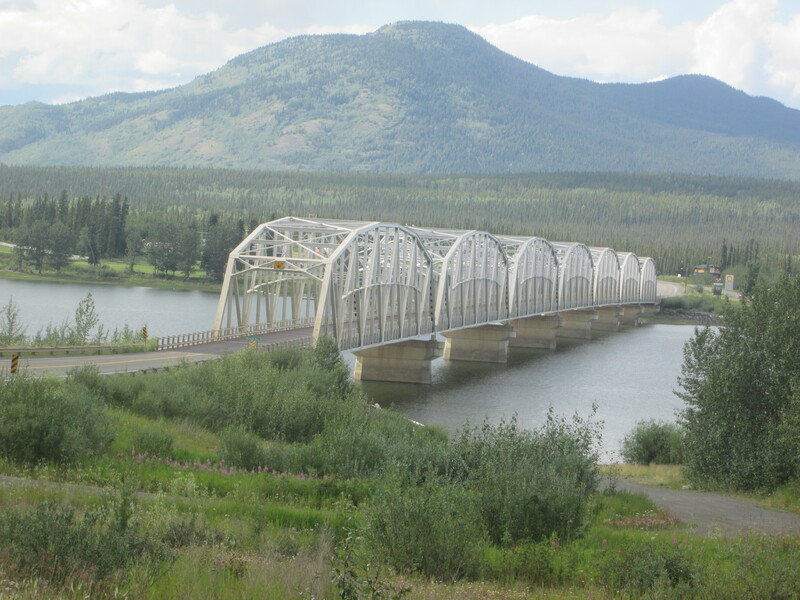 Coming into Teslin., you have a long, long iron bridge with a see- through grill to cycle over. My first stop was the service station. I was craving something sweet. I went in and to my surprise Sebastian was there with his Aussie friend, Will. I last saw Seb a week ago In Stewart. Unfortunately my “Warm Shower” hosts are away.. Andre kindly said I was welcome to go and camp on their property. The 5 km ride on a rough dirt road down to the lake was well worth it. Andre said they were off the grid and. I had the impression it was just going to be a section with a bit of a shack. When I got to the end of the road. I went up a small driveway and found a hidden paradise. A very secluded lake side property. There was a proper house, wind socks and a hanger for a helicopter. At the lake was a small jetty with a launch. Close to the lake was a picnic table with a camp fire and a stack of firewood. I made myself at home setting up camp and cooking a huge dinner. I was starving after a big day. 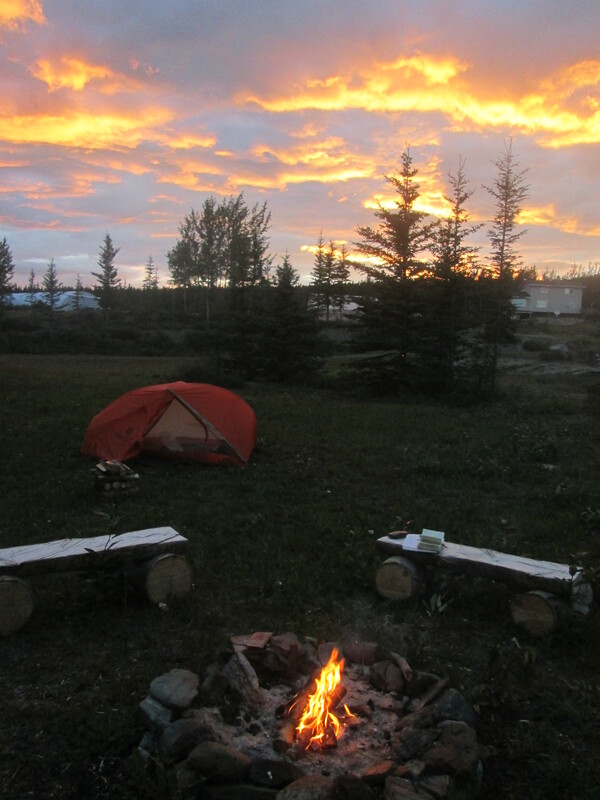 I got the camp fire going………..luckily there is no fire ban in the Yukon. It was a lovely evening with little wind. At 11:30 p.m. it was still light with the sun only just going down to be back in less than 4 hours time. I had a good bear encounter this morning. I was cycling along when I came up on a young juvenile eating berries on the side of the road. I stopped and crossed over to the other side of the road. The bear then decided to cross the road as well. On at least two occasions it came towards me. I stayed pretty calm but I did get my bear spray out, had the safety off and the finger on the trigger. I shouted at the bear and it eventually walked off into the bush. Here is a video of the encounter. 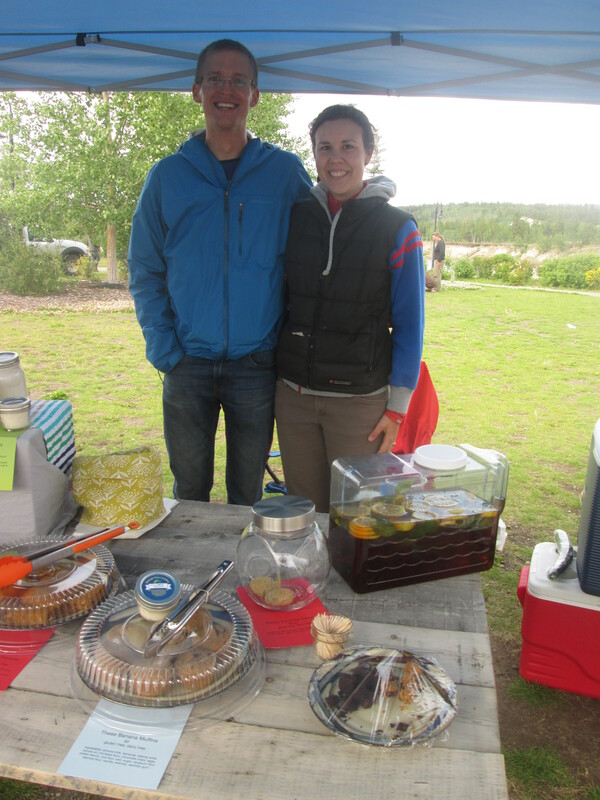 Johnson’s Crossing had a good service stop with freshly baked goods, a camping ground, picnic tables and ice-cream. I was sitting outside when Seb and Will turned up to join me. It was a good long break before I pushed on again for Mash Lake. I left the boys behind. The wind came up again and the last two hours were a real drain. Not made any better when the misty rain arrived. I was happy I had another “Warm Showers” host. 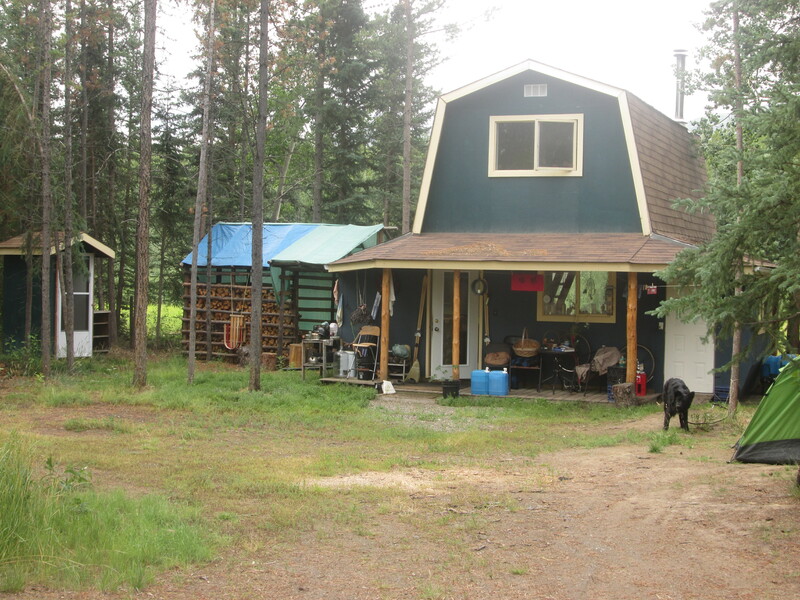 Peter has a cabin backing onto the lake. I slept in the old sauna, converted to a sleep out right on the lake’s edge. It is always nice when you only have a short ride for the day. 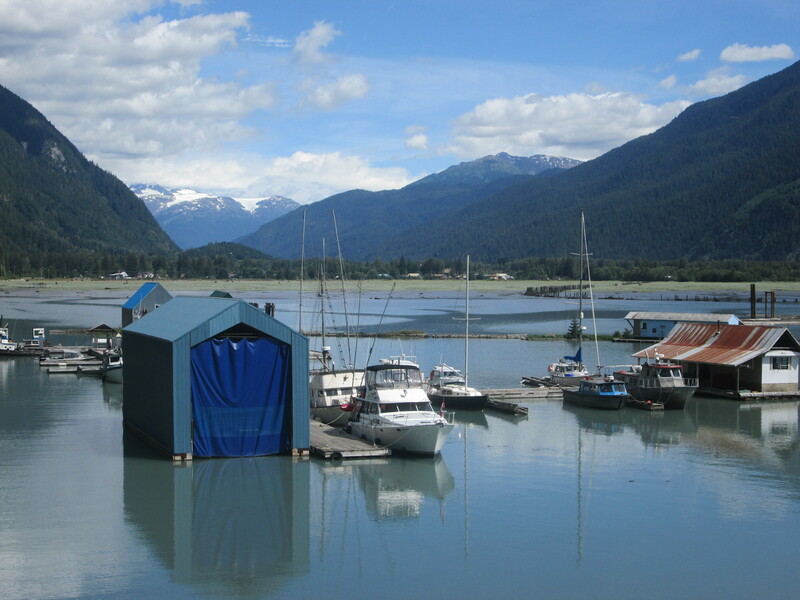 I am really looking forward to getting to Whitehorse and having a 3-4 day break. I have been pushing quite hard since I left Smithers and I am feeling pretty drained. 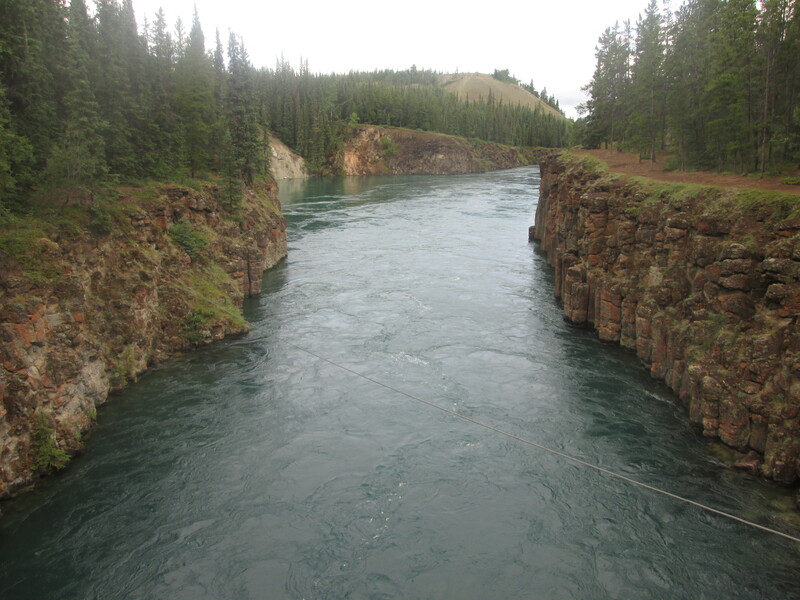 About 8 km from town I took a small detour down to Miles Cannon where the Yukon river is squeezed between a narrow gap before opening up into a lake used by float planes. When I arrived in town I went straight to the information centre and surprise, surprise Bob and Laura who I last saw in Kitawanga were in there. They very kindly took me out for lunch. They say a lot of people come to Whitehorse and never leave. After stopping here for a week I am nearly in that category. So I have had a good week in Whitehorse. On Tuesday I walked in to town along the river trail and then had a good wander around. Its a well laid out town of 30 000 people. Everything is within walking distance. 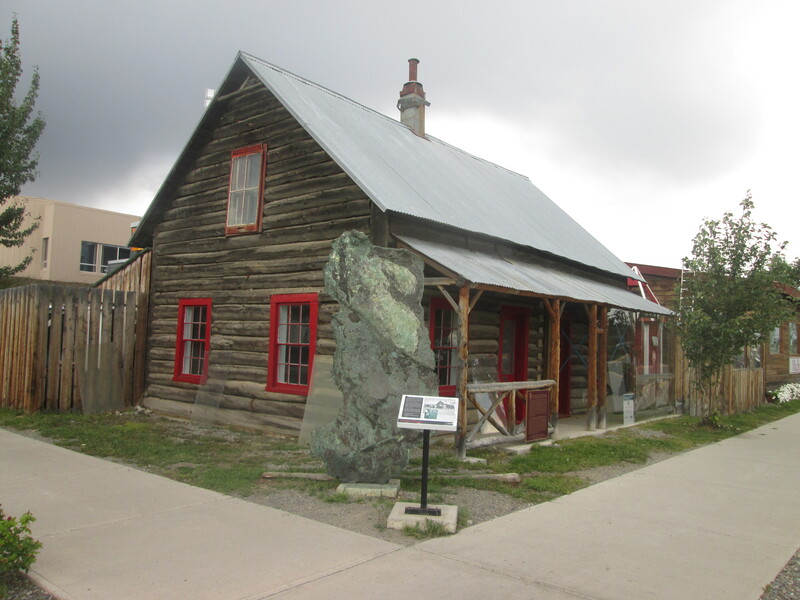 There are a number of original old log cabins around town including a log cabin church. 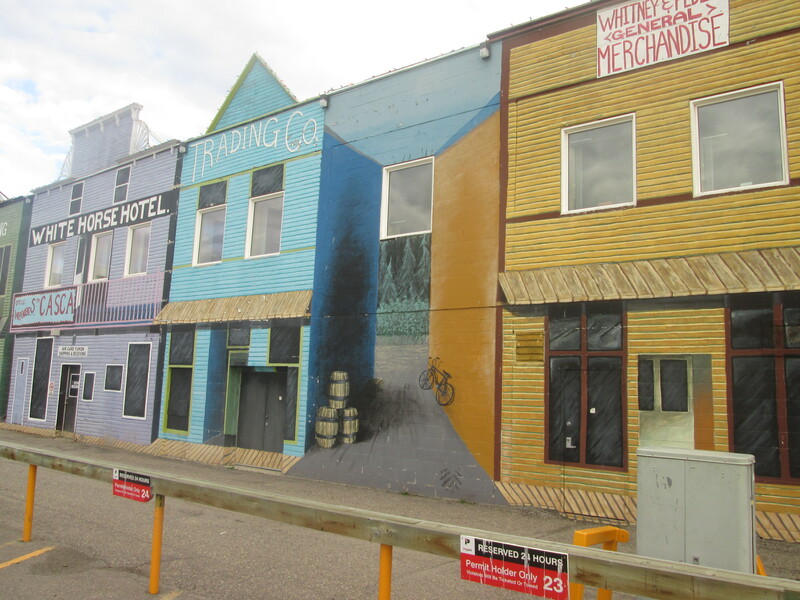 To keep in character, one street had a whole mural of shop frontages painted on its back. 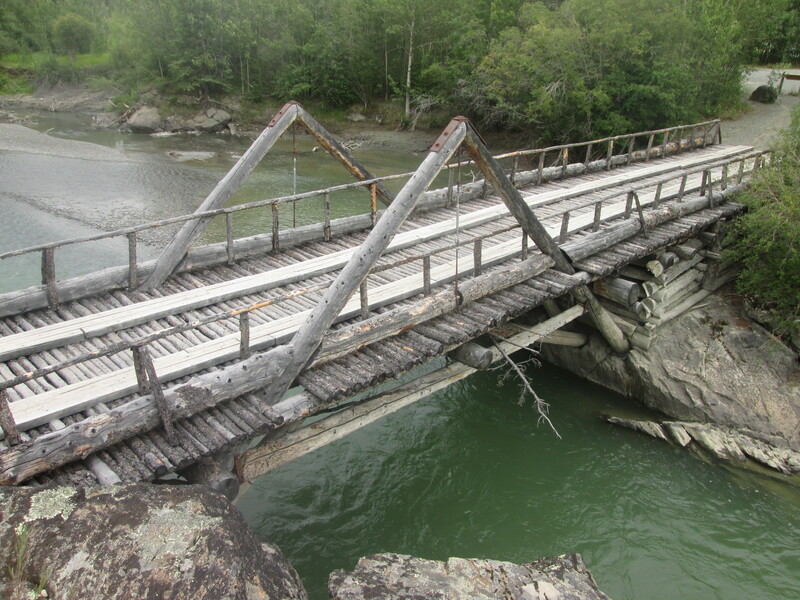 White horse is built on the banks of the Yukon river. Along the river is an old tram running up and down. After two nights I left Colin and Kathleen and went back into the city for the day. Tried to do some touristy thing. Watched a good nature video of the Yukon in the information centre, afterwards went and did a tour of the SS Klondike. 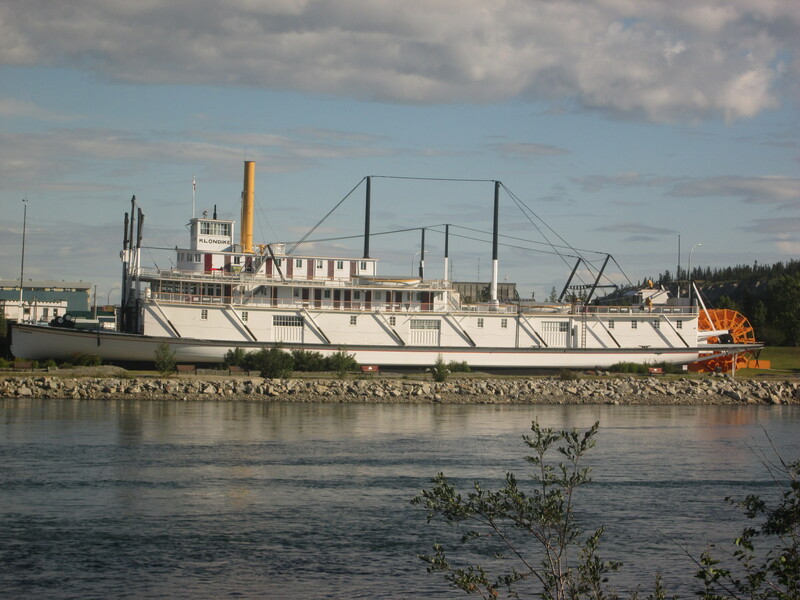 An old paddle steamer that used to take cargo up and down the river to Dawson City. At midday in a local park are daily concerts and I made it in time for a bit of Arcadian music, fiddle, guitar and banjo with French and English songs. 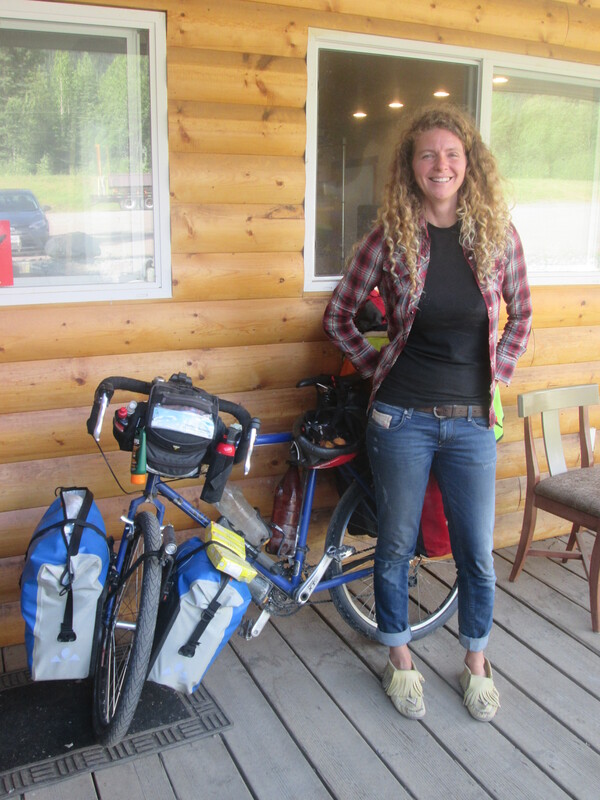 I had a new host Carrie who lives 15 km out of the city in a log cabin with no running water and only solar for electric. To reach the cabin you need to cross an airfield. Carrie said she would leave the gate open and to close it and lock it after I come through. Thats what I did. A car had driven through ahead of me and the woman driver was in a panic after ignoring the signs and venturing onto the runway. She was now stuck. So I had to continue into the forest to find my host to get her to go back and open the gate for the poor woman. 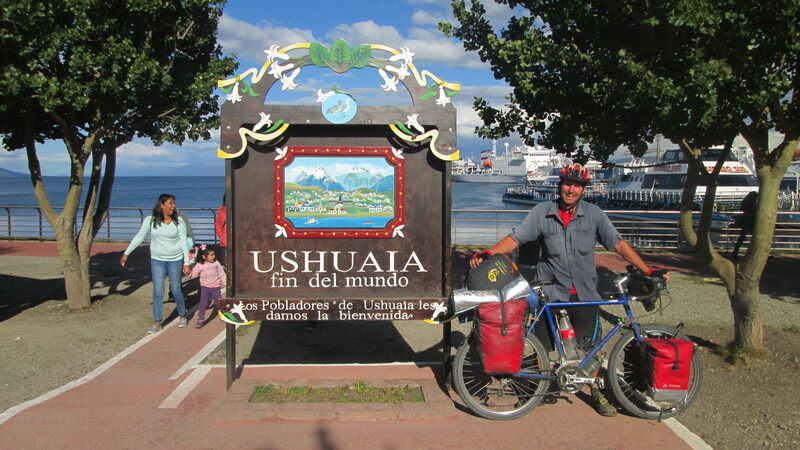 Thursday I had a bike free day and after having a unsuccessful attempt to hitchhike. In the afternoon I walked for two hours to get back to town. I was only going in to visit the evening market at shipyard park and to see Colin and Kathleen who had a gluten-free and Candaria stall. They kindly gave me some ice tea and pumpkin slice. Getting home was a lot easier with a lift from Carrie. Friday was going to be my last day and I was a lot more successful getting a ride back into town after only 5 min of trying. 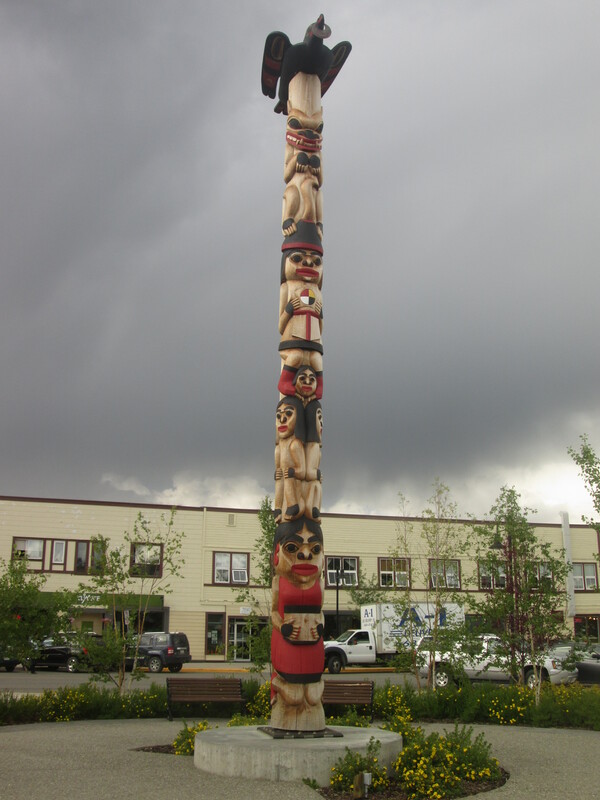 I went straight to the Kwanlin Dan culture centre to learn a bit about the local first nation people. I watched a couple of good videos. At midday I took my lunch and went back for another Concert. This time in was classical guitar. Saturday morning I was all packed up and ready to go when Carrie said you are more than welcome to stay another day if you want. I was very easily persuaded. I hitchhiked in to the city again. An elderly couple picked me up. They said if I wore a baseball cap I would have more chance of getting picked up. I went back to the Culture Centre to watch some more videos on the interaction of the first nation people and the first European settlers who came as part of the gold rush in the late 1800s. Last night we had a BBQ and a bit of a camp fire in the backyard. It was after midnight before I got to bed. 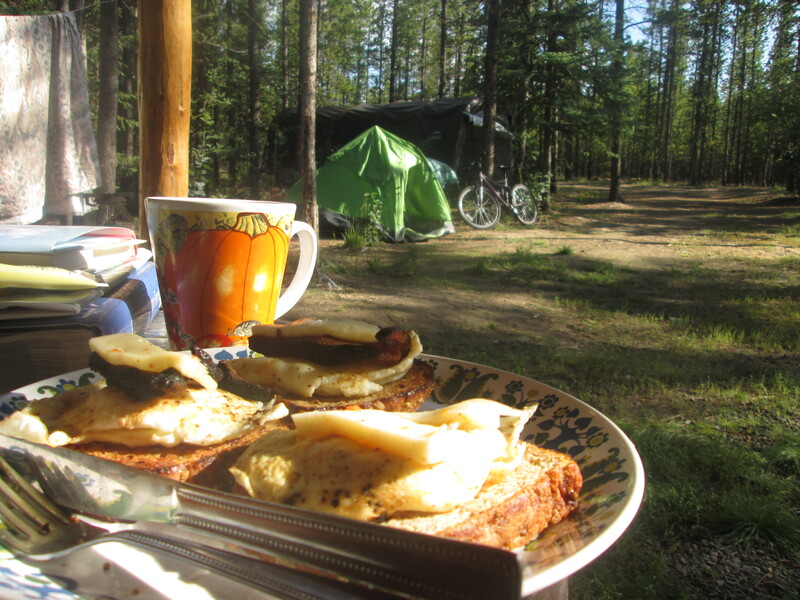 It meant a bit of a slow Sunday morning with starting the day with a cooked breakfast and drinking coffee sitting on the back porch. 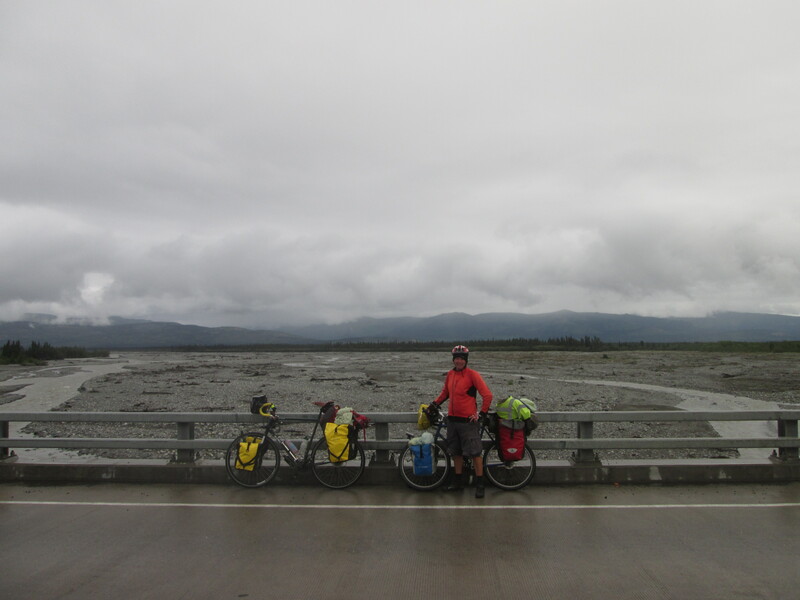 It was 10 a.m. before I pushed off and I needed to do 144 km to get to Haines Junction. I was already putting myself under a bit of pressure. At least it was a really gentle road, with not too much elevation as we navigated between the huge mountains. The forest disappeared for a while to be replaced by bush. I made good progress throughout the day only stopping after 50 km and again at 110 km. It became more difficult in the afternoon. My legs got tired and the wind came up from the wrong direction. The further north I go he colder it is getting. It was a damp day with the low cloud. I got into Haines at 7:30 p.m. 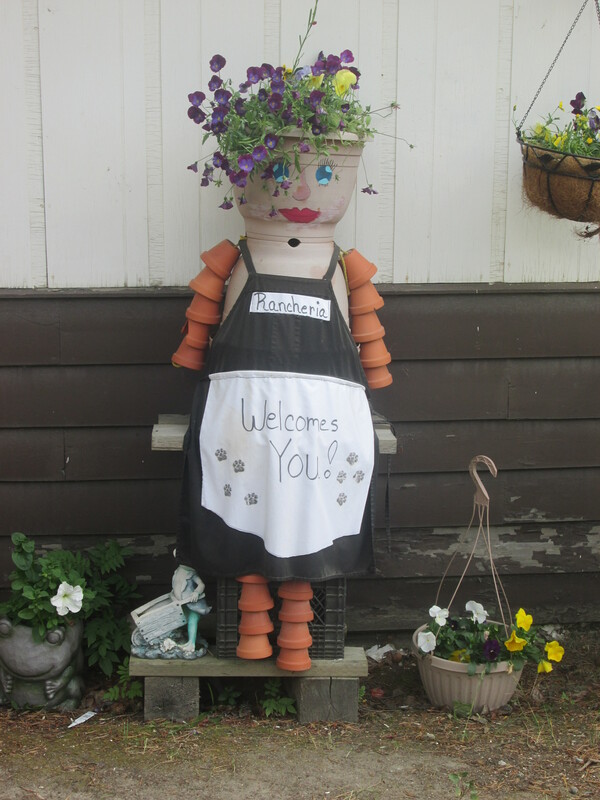 The French couple I had met near Marsh Lake gave me some details of a family they had stayed with. I contacted them and asked if I could also stay and it wasn’t a problem. 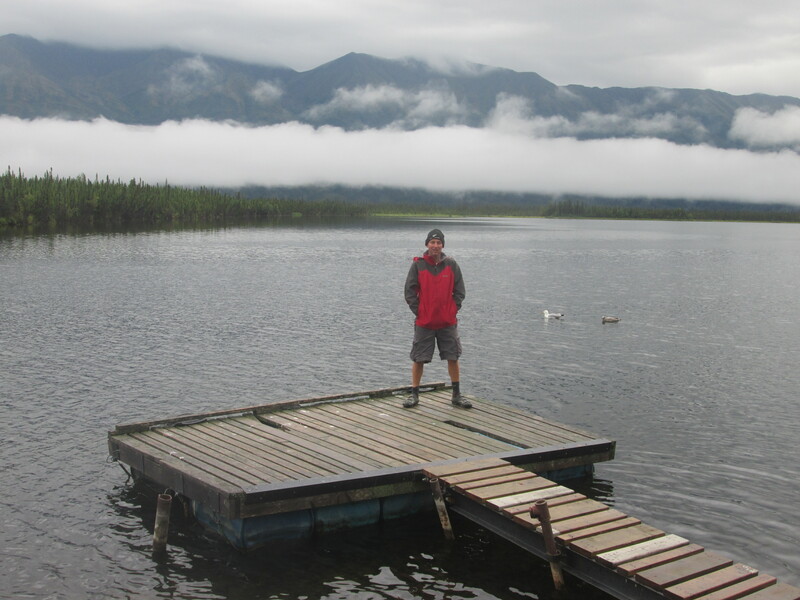 Dave who is an Artic guide and Cindi and the two boys have a nice property close to town. I was able to spend the night in their camper beside the house. I got to the visitors centre around 6 p.m. It was closed. I decided to cook out the front because it was nice and sheltered. Afterwards I decided I was just going to camp there as well. Ignoring the no camping sign – I will be long gone before anyone arrives in the morning. 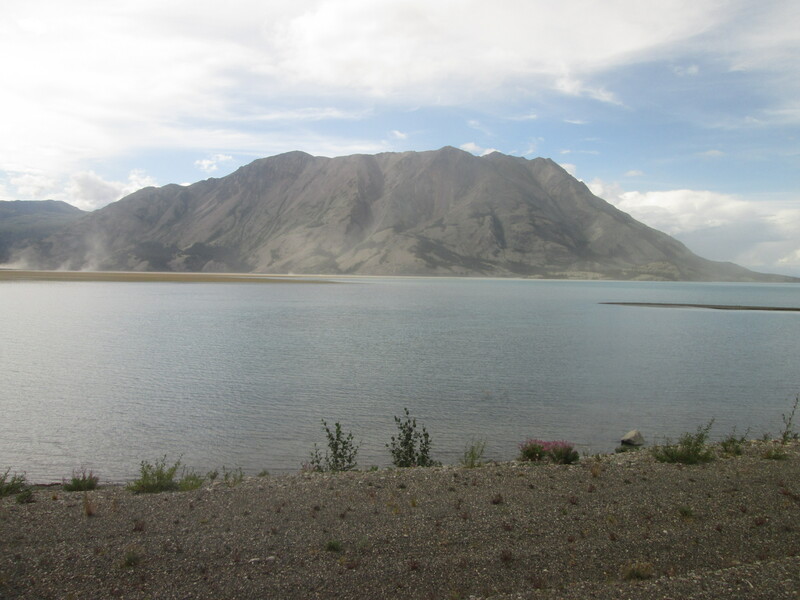 The visitor centre is on a plain at one end of the lake surrounded by 1500 metre tall mountains. There is a telescope to help look for Doll sheep that roam here. I tried but couldn’t see any. It was windy all night, then the rain came and then at 5 a.m. the wind dropped. I got up at 7 a.m. It was cold and miserable. I couldn’t hang around because I didn’t want to be here if anyone from the visitor centre turned up. 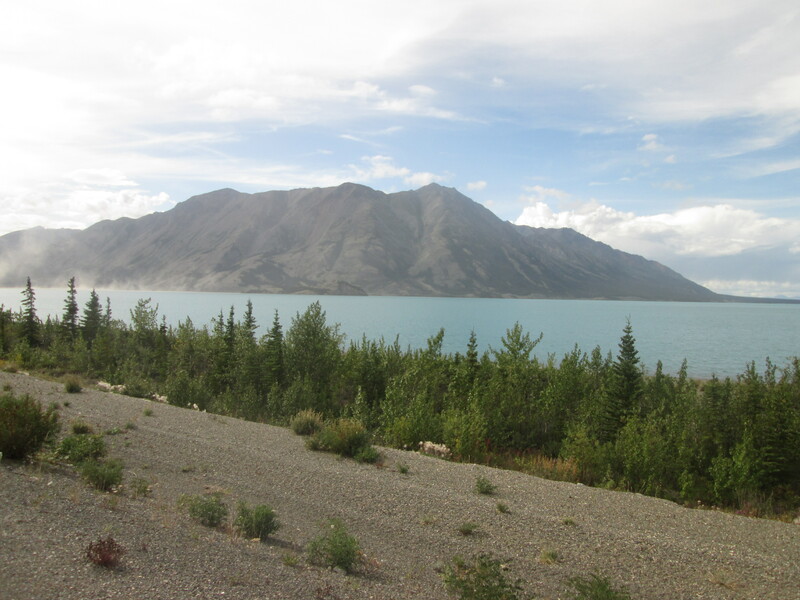 With no wind it was a nice ride along the edge of Kluane lake. 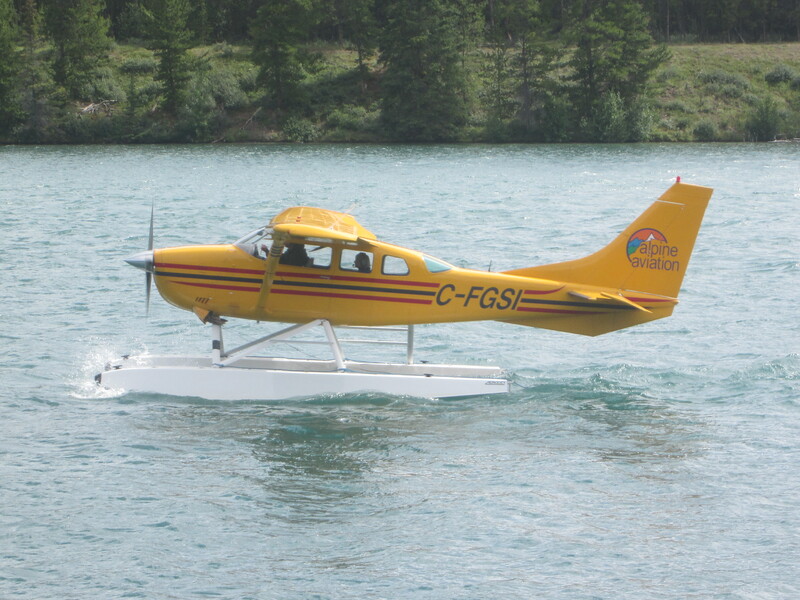 I had a float plane come over the top of me. 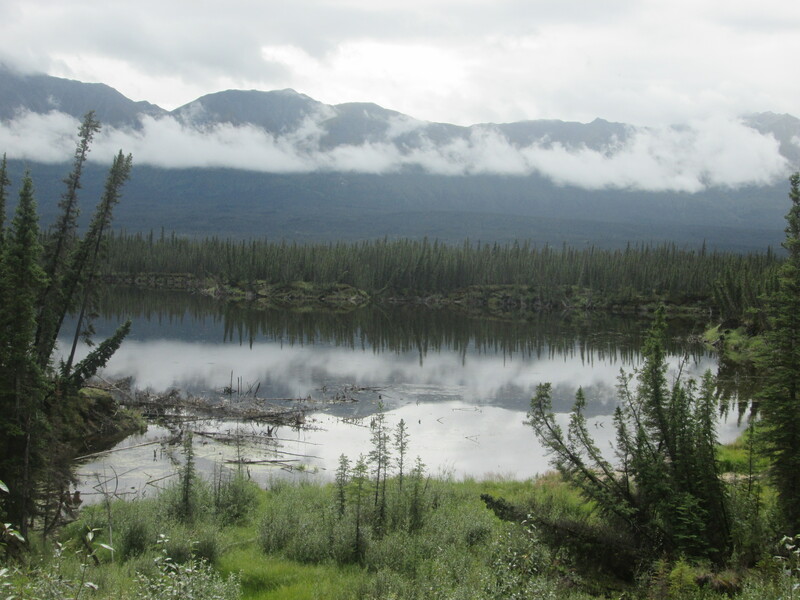 They follow the Alaskan Highway as a form of navigation. When I got to Destruction Bay which was named after the town was destroyed by a tornado in 1956 and is the last chance to get food for another 200 km, I went straight to the restaurant. Just as I was going into the restaurant I met two kiwi couples from New Zealand travelling to Alaska by motor-bike and a campervan. I talked myself in to the breakfast and endless coffee and was getting pretty settled. Then another cyclist came in. 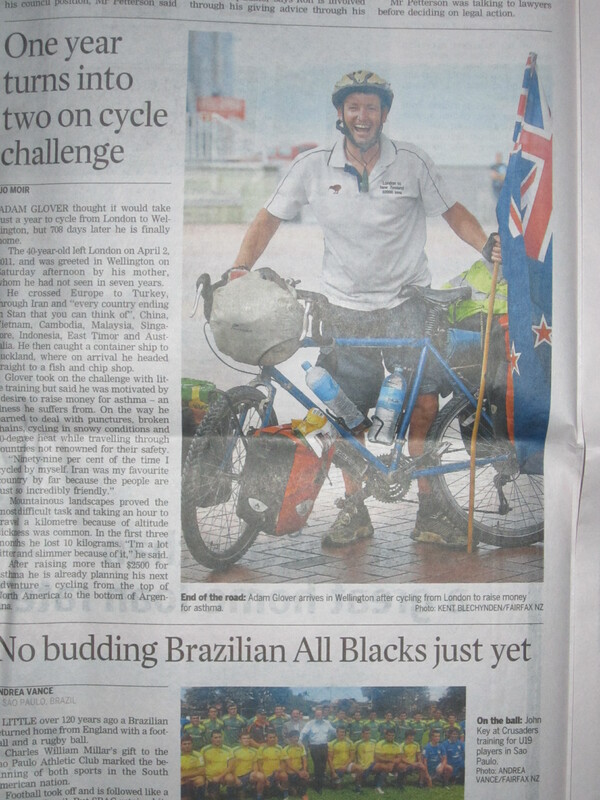 Karl just happens to be from Wellington, New Zealand and is heading in the same direction as well. Karl is travelling from Seattle to Fairbanks and back. I stayed for lunch and we chatted. Then the rain returned and I wasn’t that keen to push on. 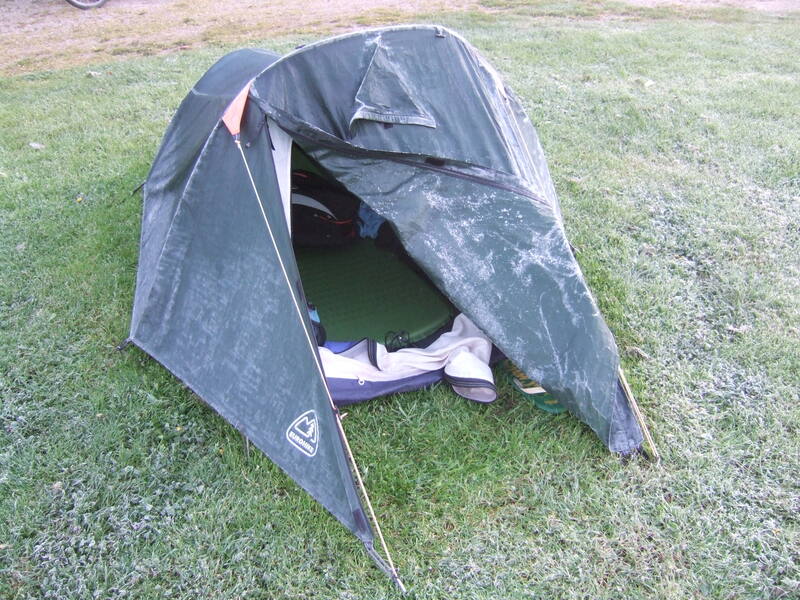 In the end Karl has let me pitch my tent on his site for free. We will cycle together for a few days. It rained for a good part of the night and it was pretty damp when Karl and I set off this morning. New Zealand. Having not met any since I arrived in Philadelphia 3 months ago, I have now come across 6 in the last two days. It was great to reach the Lake Creek Government camp ground. We put our tents up. 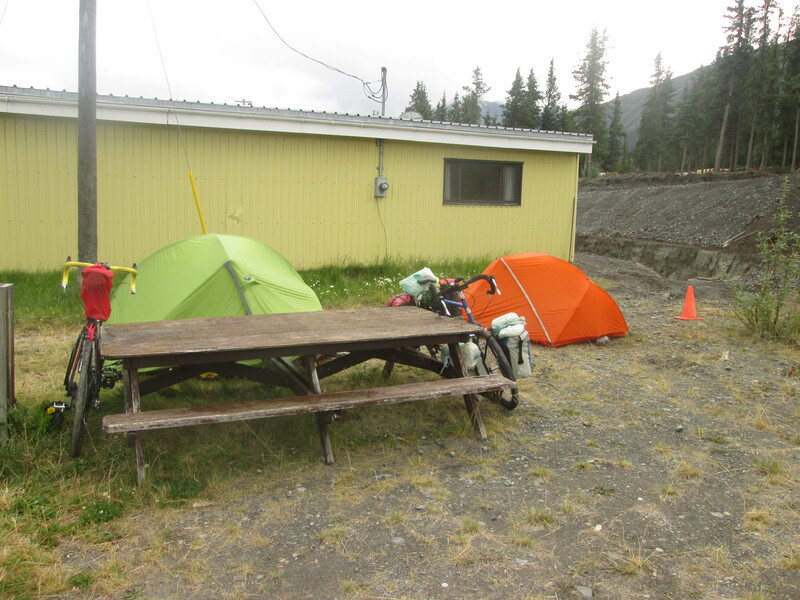 Only $12 per site and opposite the large kitchen shelter, in the centre was a wood stove. We soon got the stove going and a clothes line up to start drying everything out and a pot of water on the boil for a cup of tea. We had a few other campers come over and visit us. On both occasions they brought us beers. 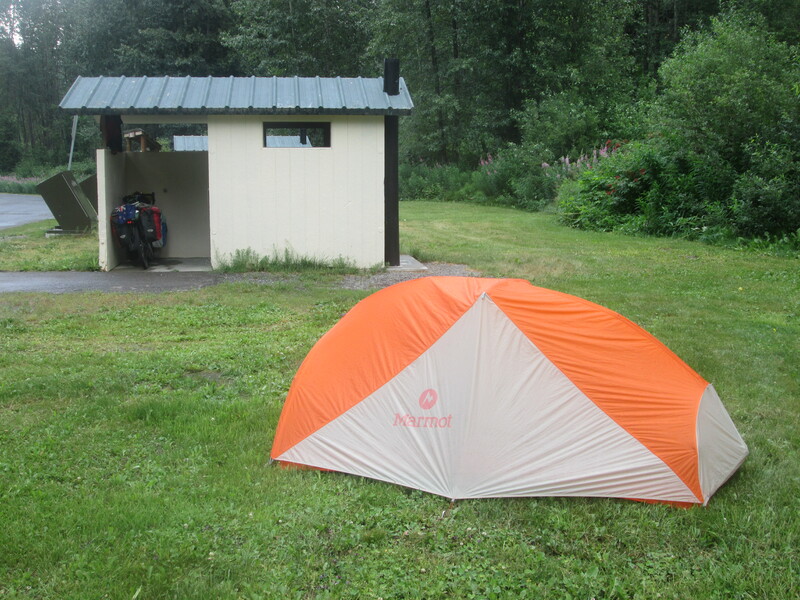 As the evening went on we decided we would relocate our tents to the shelter. Just as well because we had heavy rain in the night and the camp site was like a swamp in the morning. It was still raining in the morning when we got up. We were spoilt waking up under the protection of the kitchen shelter. We got the fire burning again and we sat out of the rain for a few hours in comfort before venturing out into a very damp soggy morning that awaited us. If the weather wasn’t bad enough we had to get back on to another 30 km of road works and dodging the potholes was a lot more difficult. 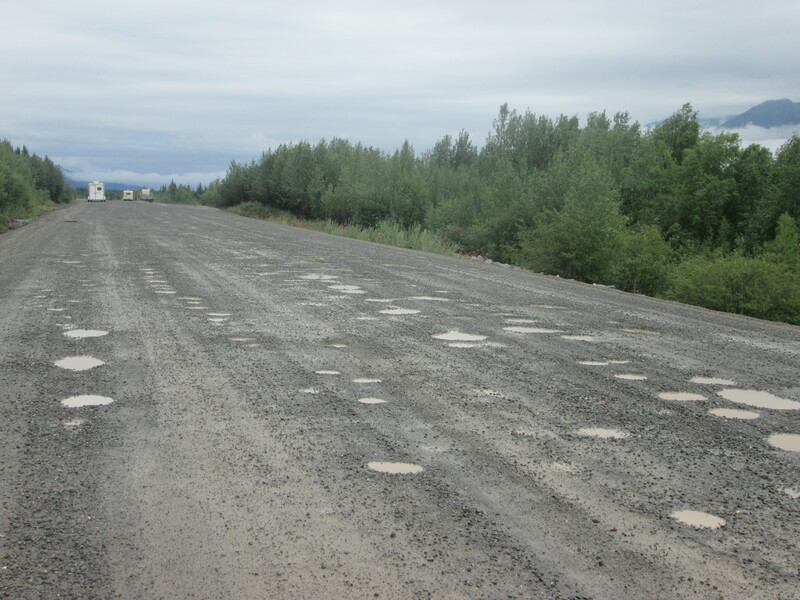 This is well and truly the worst part of the Alaskan highway so far. It is also a very beautiful part as well. The cloud was so low just hugging the mountains. The peaks sticking out of the top look like they had fresh snow on them. We were high up on the other side of the valley overlooking forest and lakes with Beaver dams. 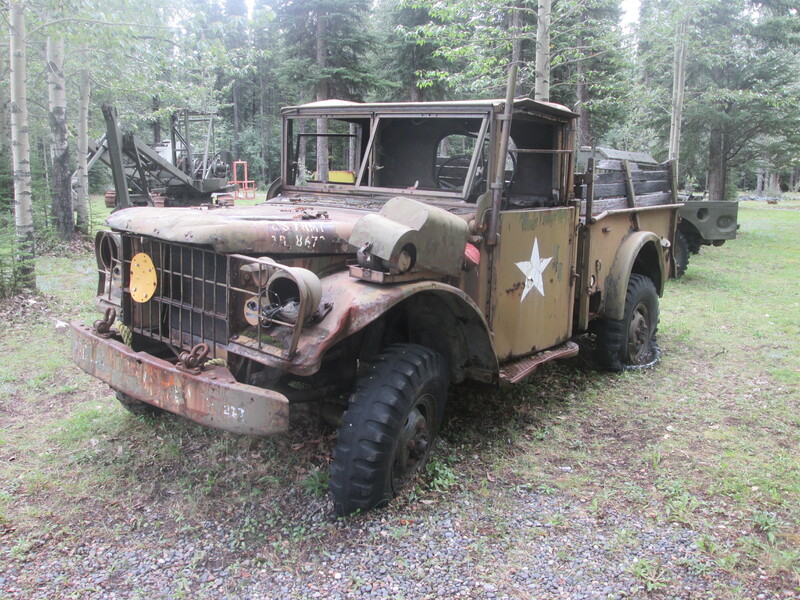 All along the Alaskan highway are the old staging stations that were built during the highway construction in 1942. When the Americans finished they destroyed all their machinery they left behind. Only a few of the staging stations remain open. Most of them are now in ruins beside the highway. Beaver Creek is a small border town with Alaska. Tomorrow will be the moment of truth on whether I will be able to get in.